Wins, Wins and more Wins! As we begin to wind down this year, SCAPTA has had an awesome series of wins. 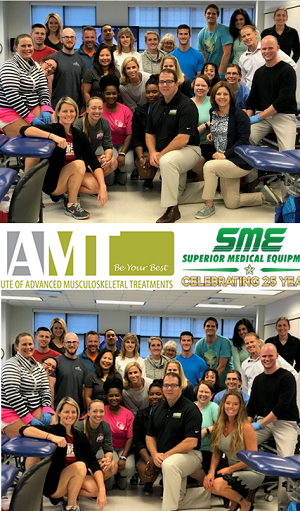 On November 4-5, we held our first level one Dry Needling class provided by the Institute of Advanced Musculoskeletal Treatments (iAMT). This strategic partnership between SCAPTA and iAMT is hopefully the first of a series of initiatives to demonstrate the power of being a member of your professional association. Members were treated to a significant discount for this event, not unlike what they receive at other continuing education offerings throughout the year. We hope to host course two in the near future to further train individuals looking to be proficient utilizers of this incredible treatment skill. Huge shout out to our great friend Tara Mintz and Superior Medical Equipment (SME) for sponsoring the event. Finally, a few quick examples of the amazing talent here in South Carolina. Patrick Berner, a leader in the state for Health Promotion and Wellness initiatives, recently passed his national licensure exam to become a Registered Dietitian Nutritionist. This makes him one of very few in the nation to have this dual licensure. Also, a grant written by Stacy Fritz with support of our chapter, titled Neurological Exercise Training Steps in Promoting Healthy Lifestyles after Stroke (NExT) was submitted earlier this year. With phenomenal scores (‘exceptional’ and ‘high’ ratings) we received the 2017 APTA Component Grant for Physical Activity, Exercise, and Health Promotion and will begin this work immediately in the Columbia area. Thank you all for your membership. If we can ever be of service to you, please reach out to us via phone, email, social media, or attending any of our upcoming meetings. Last Sunday, Nov. 5, Kyle Hopfensperger, DPT, of Kindred at Home in Charleston completed the NYC Marathon (26.2 miles). 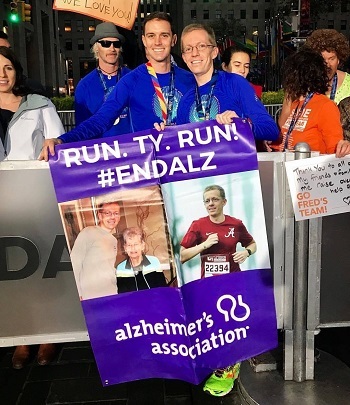 In addition to this accomplishment, Kyle ran as part of an Alzheimer's Association Team. The Alzheimer’s Association Team raised a total of about $70,000 and Kyle personally raised $3,735 for the charity. As a PT working with the geriatric population in the community, Kyle ran in honor of his patients and to help this important cause. Thanks for sharing your story, Kyle! On October 27, the Centers for Medicare and Medicaid Services (CMS) released the Notice of Benefit and Payment Parameters for 2019 proposed rule. Within the rule, CMS proposes standards for issuers and Exchanges, generally for plan years beginning on or after January 1, 2019. This proposed rule is intended to increase flexibility in the individual market, improve program integrity, and reduce regulatory burdens associated with the Patient Protection and Affordable Care Act in the individual and small group markets. APTA will be providing comments to the CMS, as well as preparing a template letter for members to submit to CMS. The template letter will be made available to members in approximately the next 7-10 days. Comments can be submitted electronically via regulations.gov. In the Search box, type in the name of the rule (HHS Notice of Benefit and Payment Parameters for 2019) and then follow the “Comment Now” instructions. Comments on the rule are due by November 27, 2017. At the end of September of 2017, Home Health Section members adopted a statement on the value of home health physical therapy. The value statement was in response to a charge by the American Physical Therapy Association (APTA) House of Delegates (HoD) several years ago that each physical therapy practice setting establish a position statement intended to educate clinicians and the public about the value of each setting to achieving outcomes. The Statement provides evidence-based guidance to clarify and identify the role, benefits and appropriate utilization of Home Health Physical Therapy (HHPT) services as an essential part in the continuum of care for qualified beneficiaries in the home health setting. It addresses patient care outcomes and compares post-acute care costs needed to attain these outcomes. Lastly, the statement discusses the patient’s perception of care delivery in the HH setting. The position statement ensures physical therapists and physical therapist assistants know the value of providing physical therapy in the HH setting. External stakeholders, including the general public, other health care professionals, professional organizations, policy makers, beneficiaries and payer sources also benefit from the statement with information about who we are and what we do.